what exactly did you dremel. take some pics of your work. Look closely at the picture in my first post (clicking on it will make it bigger). I cut approximately 1.5 inches out of the center of the engine cover. The STB is not on top of it. It's flush with it. looks great, i plan on doing the same to mine. oooh ok. now i see it. Well, I have to admit that I used my driveway as a flat, belt sander to clean up the melted plastic flashing after making the cuts. My wife was sitting outside reading a book and she looked up and said, "Geez, you WERE a poor kid weren't you?" Now she knows what to get me for my birthday. Notice any difference? Looks good! 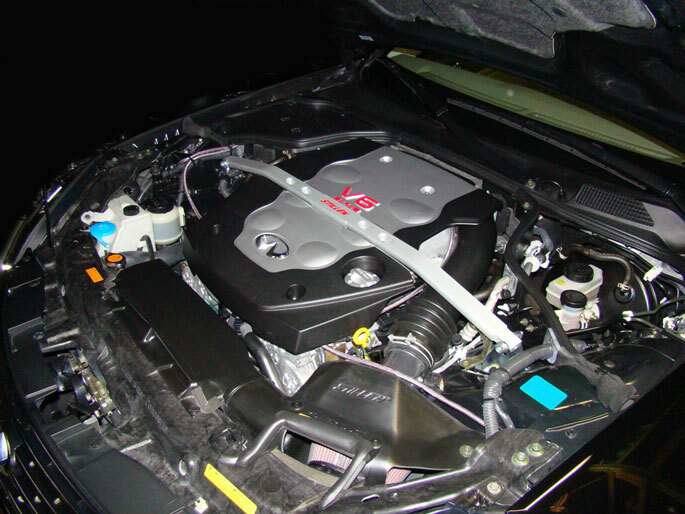 I think if you use the engine cover from the 350Z it will look even better w/the Strut bar. Thanks for the compliment. Yes! I do notice a huge difference but I'm sure it can't be tied back to just the STB. I also installed Tein 350Z S-Techs, Tokico DSP-9s, Stillen Sways on Prothane bushings, and a Stillen engine brace. The Sways are set at med/med, the Tokicos at 4.5. I cut the rear spring mounts .75" and the drop is 1.25" in front, 1" in the rear. I must have hit the mark because the car handles so tight and sticks like it's on rails and the VDC is not so quick to react as it used to be. It's at the dealer this moring getting aligned so it can only get better. I have not installed any camber parts yet to see how close the dealer can get it to spec. There is a guy there that is pretty confident he can dial it in with what I have. We'll see. But doesn't it say "Nissan" or "350Z" on it? They are coming. The car needed a serious bath so by the time I was done it was too dark for pics outside of a profile. Here is one in the garage of the front wheel, down the side of the car. BTW, thanks for the springmount mod. It was easy and made all the difference. I'm still surprised that Tein advertises a drop in the rear and my initial drop was only .25". 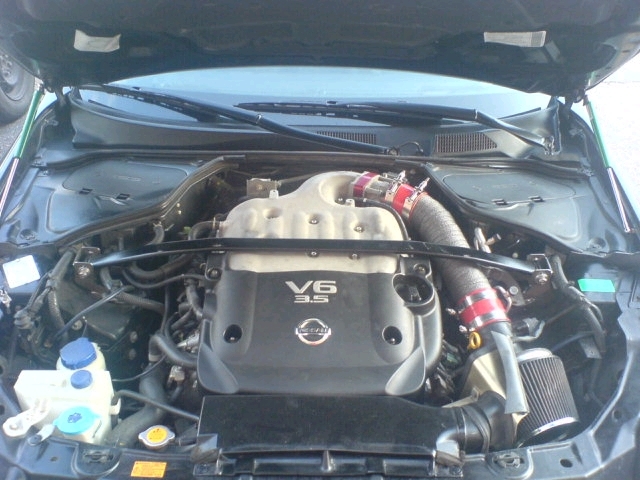 With the 350Z S-Techs, it should have been 1.1"
No it dosn't say "350Z" only Nissan, but who makes Infiniti's Nissan.